As I have mentioned before, I have never been a big fan of meat or organ meat, but liver is an exception, the only exception. 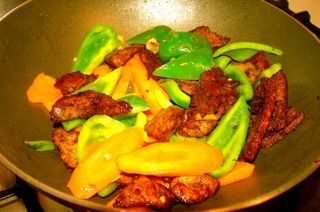 Not only that, there are only two ways of cooking liver that I would happily eat — liver salad and this stir fried liver pieces. In China, pork and chicken liver are the most popular kinds of liver in restaurants as well as at home. However, because of my Hui ethnic group origin, I can only eat liver dishes in ‘Hui’ restaurants, and there lamb liver and ox liver are commonly used. But the methods of cooking are very similar, the only difference in case of this dish would be the choice of vegetables. Many ‘Hui’ liver recipes use green pepper and carrot; however, there is no restriction on what to combine liver with though. I personally prefer lamb liver, it is softer and tastier. — Do I sound like professional when comes to liver? Ha… no, no, I am actually getting more and more scared of touching it when cooking. Back in China, or in many butchers where I used to shop in Manchester, one would buy the whole liver, which makes it even harder for me to touch. The ones well-packed in supermarkets look better, but the disadvantage is that they are already chopped in pieces which makes slicing more difficult. The original name for this recipe is ‘Liu gan jian’ in Chinese. ‘Liu’ (1) is one of the common ways of stir frying, I have mentioned in other posts (for example, ‘Liu Yu pian‘). ‘Gan’ means liver, ‘jian’ means ‘something sharp, or the tip of the object’, I guess it refers to the shape of the liver pieces in the recipe. However, in the dish I made, there is no obvious ‘sharp tip’, since I could only chop according to whatever the shape it comes in the package. 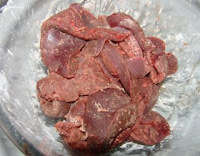 It is one of the most popular way of Chinese liver recipes. It is not difficult to make, but making it soft and tender is very important, I have failed so many times. Spring onion, ginger, garlic, oil, cooking wine, corn flour, soy sauce, vinegar, sugar, sesame oil. 1) Slice the liver into very thin pieces, say around 2cm width, 4cm length, and 0.3cm thick? 2) Mix the liver pieces with 1 teaspoon cooking wine, 1/3 teaspoon of salt, and corn flour mix (with water). 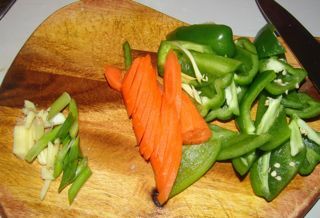 3) Chop one green pepper into similar pieces to the liver, and 1 good size carrot into slices. 4) Chop a good piece of ginger, one spring onion, and 3 garlic gloves into small pieces. 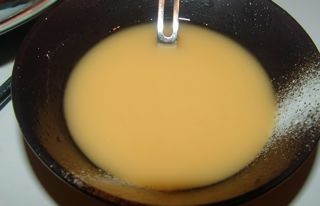 5) Mix 1 teaspoon of corn flour with 1/3 teaspoon of salt, 1/2 teaspoon of vinegar, 1/2 teaspoon of sugar, 1 tablespoon of soy sauce, stir well. 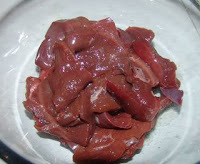 2) Put mixed liver pieces in the oil, lightly fry. 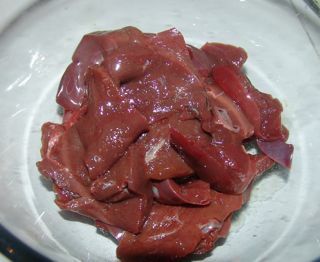 When the colour of the liver changes, quickly remove them from the wok. (If fry them too long, liver will get harder). 3) Remove the oil from the wok, and add around 2 tablespoons of oil. 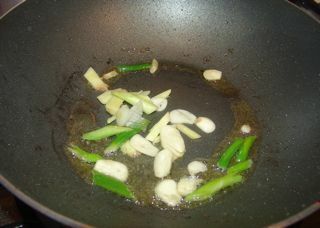 4) When the oil is hot enough, add ginger, spring onion and garlic pieces into the wok, stir fry until you can smell them. 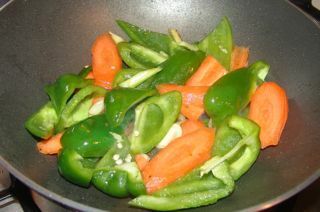 5) Add in chopped green pepper pieces and carrots, stir fry for around 3 minutes. 6) Then add in the liver pieces, mix well with other ingredients in the wok.